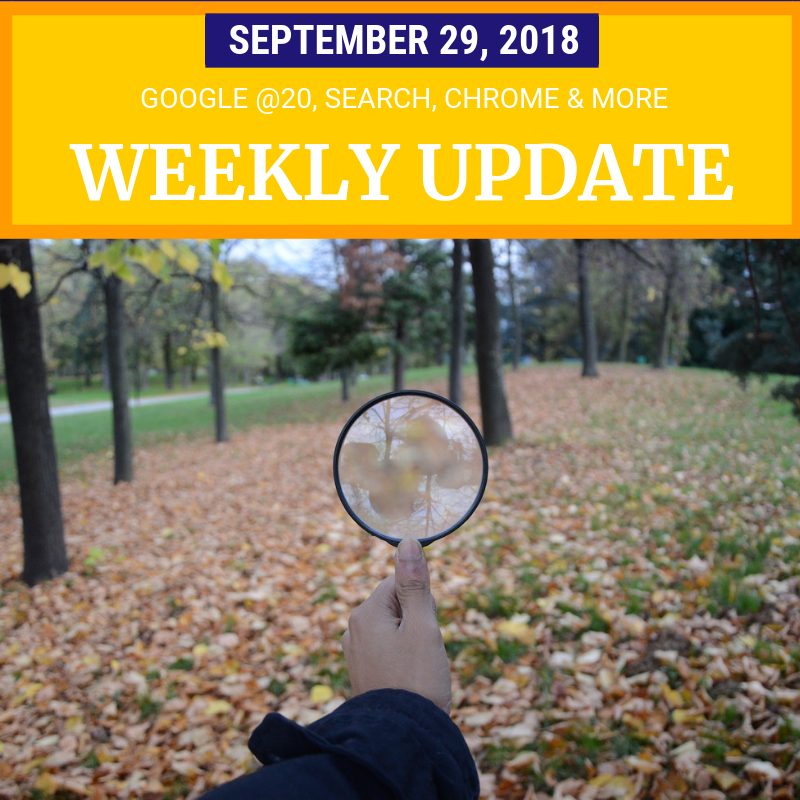 This week Google celebrated their 20th birthday with new search features, historical overviews, plus tips, tricks and Easter eggs. Plus there are updates for Chrome, Hangouts, Project Fi and much more. Google has noticed people sometimes search for information about a topic over the course of several days. To help you save and organize your searches, Google is using what it calls the “Topic Layer” to help understand what you are looking for. There are new Activity Cards that show pages you’ve already visited and previous searches you’ve done on a topic. You can add links from an Activity Card into a Collection, a way to keep track of groups of links. And Google will “intelligently show subtopics” related to your search. A common reason to save and organize your searches over the course of a few days or weeks is when you are planning a vacation. Google is updating “Your Trips”, to make it easier to organize travel plans still in the works and resume planning where you last left off. Google is also making it easier to organize an occasion with group planning in Google Maps and the ability to book attractions, activities, restaurant reservations and more via Reserve with Google in Maps, Search and Assistant. Google is integrating more video content into the Search results. A new “featured videos” section in the Search results adds visual content about a topic. And Google is automatically creating AMP stories about “notable people” that incorporate related video, images and links. Google Image Search has a new look and new features. Search results should be more relevant, with greater weight placed on the authority and “freshness” of the web page with the image. And the search results should be more meaningful, with added context from an image’s website, photo Credit and Creator (and soon Copyright) metadata, and Google Lens AI technology to help you find related information. What’s Google’s next step? Providing you “information and inspiration” on topics you are interested in without having to perform a search. “Discover” isn’t just the new name for the Google Feed, it represents a new direction, with both news and older “evergreen” content provided based on what Google thinks you are interested in - your next vacation, hobbies, and more. Google even tries to predict your level of expertise, so that it shows “intro” information to newbies, and advanced information to experts. Creepy? Useful? I’m not sure. The Hangouts Chrome App will be going away “soon”. Note that doesn't mean Hangouts is going away on desktop. Google recommends switching to the Hangouts Chrome Extension, or you can continue to use Hangouts at hangouts.google.com or in Gmail. This update is likely because Chrome will be retiring all apps, a change that has been in the works since 2016. Google responded to feedback and privacy concerns around changes made in Chrome 69. If you are familiar with the way Google accounts work, the changes probably didn’t seem like a big deal: if you sign into your Google account in Chrome, it now also signs you into Chrome itself, and Chrome displays your account’s profile photo. It does not change the way Chrome synchronizes your bookmarks or search history across devices. What it does do is allow Chrome to display your profile image when you are signed in to Google, a useful indicator on shared computers. But Google didn’t explain this update clearly, and many users believed this enabled Chrome sync. Chrome 70 will have new settings to turn this off, and will make it clearer when sync is enabled. Search in Android Messages now lets you view messaging history by contact, including group conversations, and to see the photos, videos, addresses or links you shared with each other. If you are Project Fi user in an area impacted by Hurricane Florence, you should be getting a $20 service credit. If Flo broke your phone, uBreakiFix is teaming up with Google to offer free Pixel repairs. This week was the Microsoft Ignite conference, where they made a number of announcements, including password-less sign-in to business applications, smarter Microsoft Office, new Microsoft Search for Windows, Office and Bing and more. Facebook had bad week, with the reveal that they use the phone number you provide for 2-factor authentication to target ads, and a security breach that could have allowed hackers access to 50 million (or more) accounts, both on Facebook itself and on third party sites where users sign in with Facebook authentication. This story is still developing, and there will probably be more details over the coming weeks. Plus there are more tips and updates for YouTubers, business owners, advertisers, and more. Read on for details. US Citizens: make sure you are registered to vote! Text adventure Easter Egg in Google search: can you complete the quest?